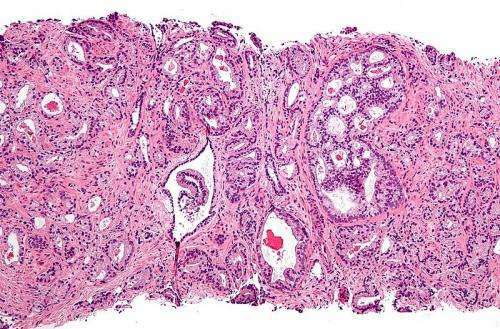 A new approach to analyzing prostate gland tissue may help address a major challenge in treating prostate cancer - determining which tumors are unlikely to progress and which could be life threatening and require treatment. In their report published in the journal Scientific Reports, Massachusetts General Hospital (MGH) investigators describe how cellular metabolites - proteins produced as the results metabolic processes - in apparently benign tissues from cancerous prostates not only can determine the grade and stage of the tumor but also can predict its risk of recurrence. "Prostate cancer detection through elevated PSA levels followed by prostate tissue biopsies often cannot differentiate between patients with early-stage, indolent disease and those with aggressive cancers," says Leo L. Cheng, PhD, of the MGH Departments of Radiology and Pathology, co-corresponding author of the report. "The additional metabolic information provided by magnetic resonance spectroscopy can help guide treatment strategy, both to prevent overtreatment of slow-growing tumors - a critical and widely recognized current issue - and to identify the aggressive tumors for which additional treatment should be considered." It has been estimated that more than 70 percent of men who receive a prostate cancer diagnosis after PSA (prostate-specific antigen) screening and biopsy are likely to have less aggressive tumors that will have little impact on their future health, but around 17 percent have aggressive, potentially fatal disease. Traditional histologic analysis of prostate gland biopsies - which may miss the most informative tissues - classifies tumors based on their cellular structural appearance and cannot distinguish dangerous tumors from those that can safely be monitored through watchful waiting. The team first analyzed benign samples from 82 patients to identify any metabolic changes that appeared to reflect key prognostic factors - tumor grade, which reflects overall prognosis; stage, how far the tumor has spread, and the likelihood of recurrence. They separately analyzed samples from the remaining 76 patients and found the same associations between metabolite levels, grade/stage and recurrence risk. Specifically, metabolic profiles of what appeared to be benign prostate tissue were able to differentiate more aggressive from less aggressive tumors and tumors found throughout the prostate gland from those confined to a limited area. Levels of a metabolite called myo-inositol - known to be a tumor suppressor - were elevated in the tumors of patients with highly aggressive cancers, the significance of which is yet to be determined. "Measurement of a tumor's metabolic activity in the initial biopsy, even in histologically benign tissue, could help to determine whether a patient should have a prostatectomy or, for those with less aggressive disease, could enter active surveillance with peace of mind," says Cheng, an associate professor of Radiology at Harvard Medical School. He and his team are now analyzing samples from more than 400 additional prostate cancer cases and working to refine the field of metabolites that provide information valuable for treatment planning.